Michael Halliday is doomed to hallucinations, psychosis and death within a year. Jared Felker conceives a project to give purpose to his friend’s last days. As the project advances, Michael confronts questions basic to the human condition with a mind melting in a morass of misshapen proteins. What is human consciousness? A soul? Are they linked? David Hawke, the friend funding the project, fights for a merger to secure his company’s future. Into this mix comes an iconoclast from California who is key to the project’s final step and the merger. Jared’s growing unease crystallizes when he discovers an audio diary Michael has left behind. Advancing the project by day and listening to Michael’s voice at night, he must choose between a place in history for himself and a place in eternity for his friend. 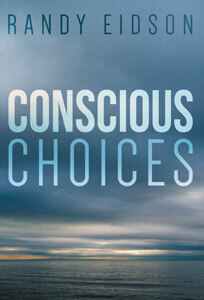 Conscious Choices is a story of love and loss, loyalty and betrayal, hope and fear. Randy Eidson was born and raised in Atlanta. He graduated from Georgia Tech in 1968. After a two year stay in Alaska courtesy of Uncle Sam, he began a thirty year career in the investment business. He retired in 2004 and took up painting which keeps him busy and out of trouble. In 2009 he and his wife, Sylvia (the most spectacular woman who ever walked the earth, according to him), were able to leave the noise and confusion of Atlanta for more pleasant surroundings in Rome, Georgia. There they built a home and immersed themselves in community life. Eidson has always been a eclectic reader – poetry, fiction, science, biography, history. He has written numerous short stories, some poetry and enough published letters-to-the-editor to achieve “opinionated cuss” status. Conscious Choices is his first novel. The idea came to him after reading an article about the spiritual implications of work being done at MIT in 1999. It took a day to sketch the story line, four years to produce a first draft, nine years letting it languish in a drawer, and three years slashing forty percent of the words to produce this finished piece. He hopes you are challenged by it to ponder to the questions it raises. If your mind is stretched, he will be happy.